Just a few years ago the question whether an armed conflict between Chechens and Ingush is possible would sound rather odd. In recent weeks, on the contrary, this seemed at times a distinct possibility. The bone of contention that provoked a two-week long protest in the capital of Ingushetia (Magas), with many protesters expressing their readiness for an armed confrontation with the Chechen nation-kin, is land. The agreement to demarcate the border between the two republics signed by the leaders of Chechnya and Ingushetia (Ramzan Kadyrov and Yunus-bek Yevkurov respectively) on 26 of September and ratified by the parliaments eight days later, was perceived by the protesters as a deprivation of Ingush lands. “It’s our land”, “There are our cemeteries”, “Everyone in the Caucasus knows where their ancestors are buried”, “There are our towers there…”, - all these statements were recorded by Russian journalists during this protest rally in Ingushetia. The first signs of the conflict appeared this summer, when Ingush youth activists, during one of their history research trips to the contested region, accidentally run into some Chechen constructors. The constructors were building the road on territories that were considered by the activists as a part of Ingushetia. 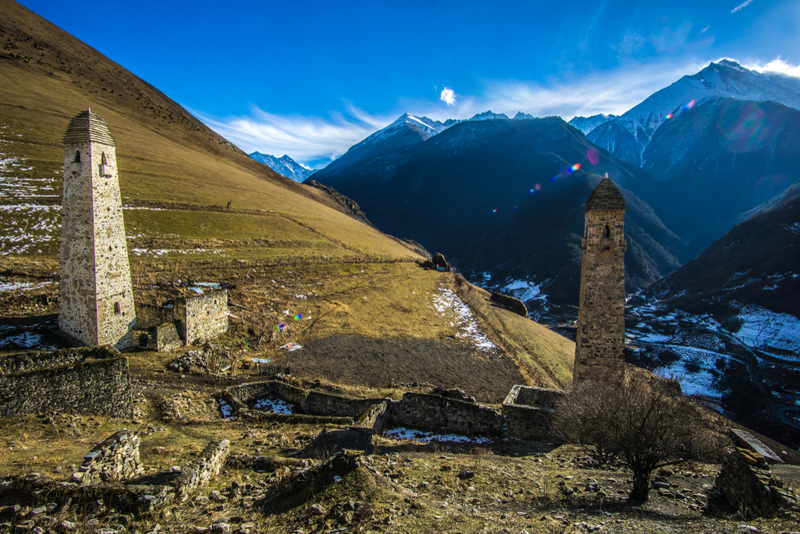 These territories bear cultural-spiritual significance because of several medieval towers that represent historical heritage of Ingush and Chechen people. There are also some oil fields under the ground. The youth demanded an answer from Ingush authorities, and after a short period of time the answer was given in the form of a border agreement that confirmed that the lands belong to Chechnya. This, apparently, was shocking not only to youth but to many Ingush people, whose small republic of 3000 square kilometres (a little bit bigger than the province of Bergamo), suddenly became even smaller. According to a cartographic analysis commissioned by Caucasian Knot based on the Annex to the deal signed on 26 September , it appears that indeedChechnya is acquiring 26.000 hectares of land, and giving to Ingushetia only about 1.000 hectares of land in other sections of the borders. No inhabited village has apparently been touched by the deal. The social networks did the rest. The restrictions put by the authorities on mobile Internet in the republic came too late. Ingush youth groups had already started mobilisation and even requested the presence of elders in the rally – after all it is them, who are expected to say the last word in this highly traditional society. The leader of Ingushetia Yevkurov and the members of the parliament were not even allowed to come and speak to the protesters. Therefore, their explanations were broadcast on the local and Federal TV. “We exchanged the lands with Chechens. One meter of our land to one meter of their land. No one lost anything…” The people did not believe it. “We just returned the lands that we have included into our territory without a consultancy with the Chechens during the war”, - was another explanation. The latter sounded more convincing but did not impress the protesters much. “We are constantly losing our lands, and this should be stopped”, - one of them expressed the opinion of many. The hotshots were already preparing to defend their land with arms in their hands, as it was in 1992 during the short conflict with Ossetians over Prigorodnyi district - a contested border territory on another side of Ingushetia. “We are ready to die”, “We are not afraid of Kadyrov and his army”, “They will not frighten us”, - were often repeated phrases. The intelligentsia protested in a different way. The multiple videos circulated through social media shown people with maps, who claim that these territories always belonged to Ingush people. Others tries to proof this belonging referring to their ancestors. “All my ancestors lived there for centuries and we are not Chechens. Ingush people are not brothers to Chechens,” – claimed one of them. Chechens disagree with their Ingush neighbours on every aspect. They emphasise the common ancestry with Ingush people and think that the demarcation was correct. In the opinion of many, these scarecely populated territories are historically a land that both nations can claim. Indeed, the clans that populated these lands are an amalgamation of the two nation. When the Soviet authorities in early 1930s decided to specify all nationalities, there would be cases such as two brothers of one family from this region would be registered one as a Chechen and another as an Ingush. In late Soviet years, Chechnya and Ingushetia were part of a single “Chechen-Ingush Autonomous Soviet Socialist Republic”; as Ingushetia and Chechnya became separate republics with the dissolution of the USSR, the exact border between them has never been fully defined, until last month. However, if a border must exist in between the two nations, in the Chechen view, these territories rather belong to Chechnya. This argument is based on the agreement made by the leader of de facto independent Chechnya Jokhar Dudayev and his Ingush counterpart Ruslan Aushev. Back in 1994 they were preparing to establish the border between the republics following the documents of 1934, which confirm the borders that existed before the two nations were united into one republic by Moscow. The first Russo-Chechen war, that began in 1994, stopped the demarcation works, which were not renewed until the very recent and above discussed events. The escalation has already reached its peak and it is slowing down now. There are still some protests planned in Ingushetia for the next days. But after a series of official apologies for the exchanged insults from the Chechen and Ingush sides, after the numerous statements made by the leaders of Chechens and Ingush non-governmental organisations abroad and home, after the meetings and addresses of many influential people in Ingushetia - the armed conflict seems less possible today. After all, as some protesters claim, it is not the land that fuels the conflict. So, what is it then? The quick and important decision that was classified by the protestors as “non-Constitutional”, made Ingush people worried about the possibility of a reunification with the Chechen republic. This suspicion of Ingush people has its logic. The Federal Russian government has already merged several regions trying to reduce bureaucracy and to save some money. Therefore, it would not be surprising had such idea reappeared in Moscow’s political agenda, the justification for which can be searched in historical experience of these two nations living together in Chechen-Ingush Autonomous Republic in Soviet times. In addition to this, Ingush people are aware of the appetites of the current Chechen administration, and indeed the rumours and tensions grew so high that Ramzan Kadyrov had to state officially that there is no plan to unite Ingushetia and Chechnya. And yet, it is not a secret that the ambitions of Ramzan Kadyrov overgrew the territory of Chechnya long ago. Either way, a merger with Chechnya not sound appealing to Ingush people. Besides losing their autonomy, they would also face the threat of being assimilated by the bigger Chechen nation. And this seems to be the real reason behind the arduous protest in Magas, which demonstrated how easy it is to spark a conflict in the Caucasus even between two brotherly nations such as Chechens and Ingush.